I don’t know why we thought touring Washington DC would be any less strenuous than New York City. On the contrary in fact. Day 1: We began by walking from our very comfortable accommodation near Dupont circle into the city. Our first stop was the National Mall, and the WWII Memorial followed by the Lincoln Memorial and the Washington Monument. On the way we saw many of Washington’s beautiful historic character buildings and were impressed by the overall look and feel of this stately city. 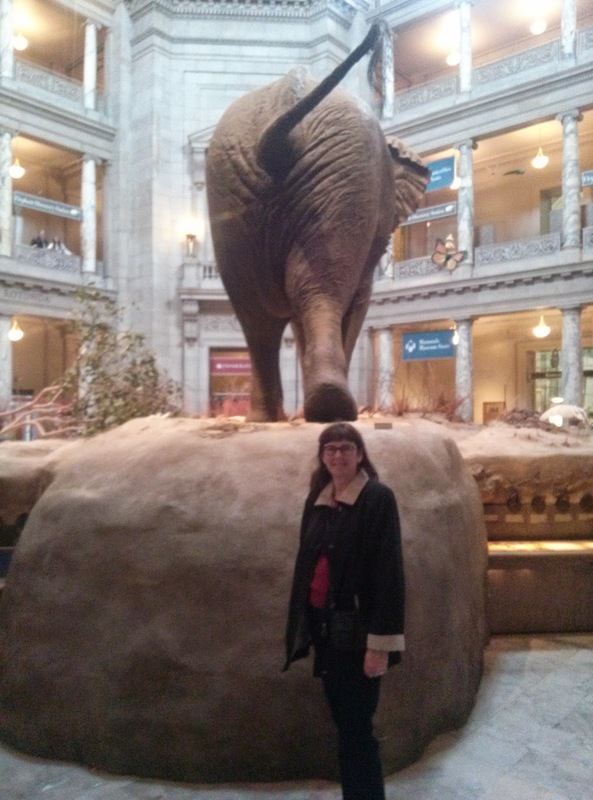 From the Mall we walked to the Smithsonian Museum of Natural History where we spent a few hours viewing mammals, dinosaurs, insects, minerals (including the legendary Hope Diamond), skeletons and the process of ancient Egyptian mummification. And we watched two fantastic 3D films: Titans of the Ice Age and Jean Michel Cousteau’s Secret Ocean. By the time we arrived back at our apartment we had walked about 7.5kms. Exhausting. Day 2: We walked even further. On the way to the Smithsonian Air and Space Museum we stopped in at the Pavilion Café in the National Gallery of America’s Sculpture Garden for coffee and muffins. At the museum we learned about the early days of flight, the invention of time devices and navigation, planes used during the various wars and man’s journey into space, from the very beginning. Along the way we passed the beginning of the parade for the 2015 Emancipation Day celebrations, which each year commemorate the abolition of slavery in DC (District of Columbia). The marching bands looked fantastic, accompanied by marching girls in a variety of outfits. The Smithsonian Museum of the American Indian surprised us both. We had no idea there were so many different tribes of Indians, which they call Universes. It was interesting to learn about the different peoples and how they live, both now and in their history. And their craftsmanship and artistry are simply stunning. Their café food was also interesting - and delicious. Back to the apartment after a total of about 10.5kms. Exhausting really doesn’t describe how we felt. Day 3: We took a well-earned rest. We walked the fifteen minutes to Dupont Circle Metro Station and took a train to Union Station, which is more like a small city than a railway station. This enormous undercover mall is chock full of shops and restaurants. Across the road is the Smithsonian National Postal Museum. This museum provided us with a fascinating walk through history; from the very first postage stamps, and methods of mail delivery including horse and carriage, motor vehicles, trains and planes. We spent a couple of hours learning about various periods in history that have been reflected in postage stamps and saw hundreds of them - even some historic Australian stamps. We lunched at UNO Pizzeria in Union Station, on divine salads with a glass of refreshing Italian Pinot Grigio, and then caught the train back to Dupont Circle. There we discovered a Books-A-Million store which, as you can imagine, I couldn’t resist. We spent some time wandering in amongst the hundreds of well-stocked shelves containing every type of book and magazine imaginable. In the end Jim bought Railway Modeller magazine and I bought a bookmark. Obviously there was just too much to choose from. Day 4: Again we took the metro from Dupont Circle, but into the CBD this time. This time there was a walk happening in support of the sufferers of Lupus and everyone was dressed in purple. In another part of town there was a Wellness Fair. We stopped at Starbucks for coffee before walking to The White House, well as close as the public is allowed, and then continued on down Pennsylvania Avenue where we watched a hockey game being played on roller skates. We finished up at Macy’s department store which just happens to have direct access to the Metro Station from its homewares department… Back to the apartment via a lovely lunch – grilled Atlantic salmon on Caesar salad for me and a pizza for Jim, again with a lovely glass of Italian Pinot Grigio. Now we’re packing and getting ready for our early morning departure to Miami!